Steve is Dartmoor born and bred and has a great love for the moors where he runs and walks his dogs regularly. Having worked all his life in the family garden machinery firm, he is making time to explore his lifelong creative and artistic interests. Steve chose the ‘Tinners Hares’ as the subject of his carving, a wonderful motif of three interlocking hares (or rabbits) which is associated with the tinners of Dartmoor and appears in the carved wooden bosses of several Dartmoor churches. The first English example of this symbol dates to AD1300, but its origins are even more ancient, dating back to the first millennium AD in China. There’s an interesting piece about this particular symbol, and hares in general on this Dartmoor website. 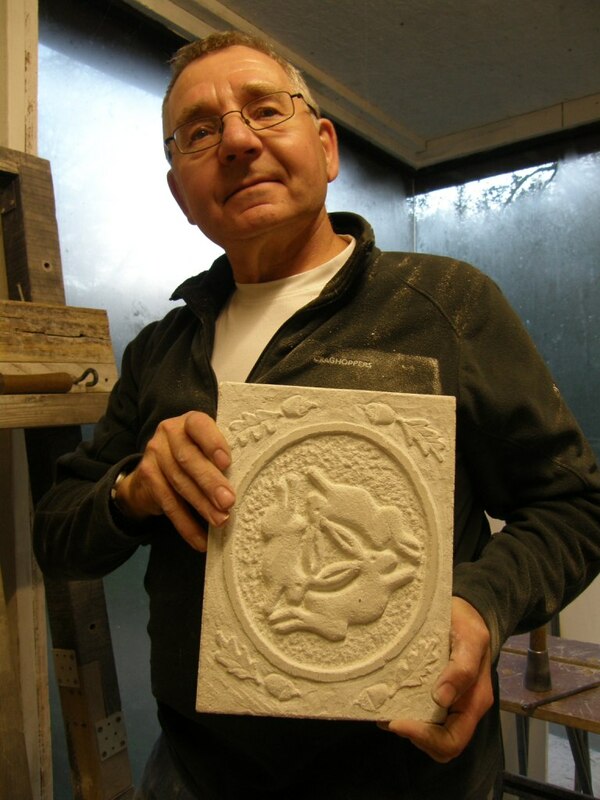 Steve started his relief carving last November and returned to finish it in January, taking two days in all. He enjoyed his time in the studio, becoming thoroughly immersed in the work, and is now thinking of starting a new carving continuing the Dartmoor theme. We hope to see him again soon.